While a lot people and establishments start out the New Year by heading toward the healthy side of things, some are diving into the exact opposite. 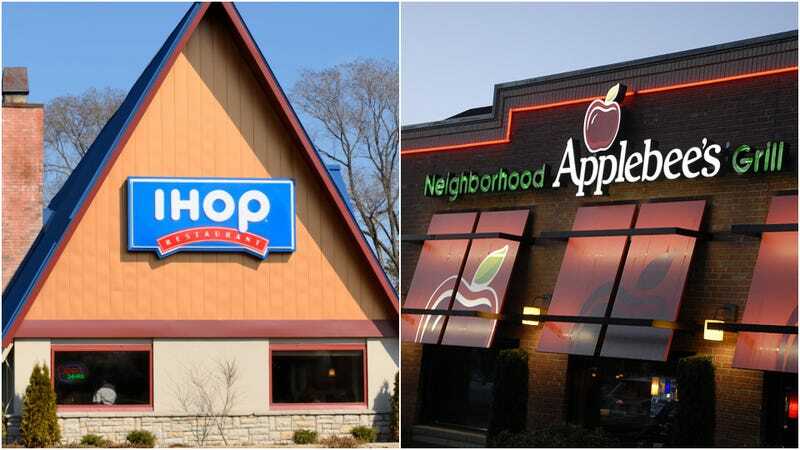 If on Jan. 4 you’re already fed up with your 2019 resolutions and would like to fall off the wagon in a big way, Applebee’s and IHOP are here to enable. The two restaurant chains have decided to kick off the new year with some all-you-can-eat deals, to fill up your stretched-out-from-holiday-eating stomach for a limited time (fortunately, says your pants). At IHOP you can get all-you-can-eat pancakes with any breakfast combo, the ideal accompaniment to top off your light breakfast of Country-Fried Steak And Eggs or the Steakhouse Combo. Then for lunch and/or dinner, head to Applebee’s for all-you-can-eat riblets, chicken tenders, and shrimp with French fries and coleslaw for $14.99. And for your second round, you can even change up that main course, swapping the riblets out for shrimp, or vice-versa. Okay, that does sound like a good deal for $15 (top it all off with a $1 cocktail—yikes). Frankly, the whole all-you-can-eat thing can sound fascinating to those of us who are not competitive eaters. Since I usually barely finish what’s on my restaurant plate, any AYCE deal would be lost on me. For my large-size husband, though, or my son who is either on the verge of a major growth spurt or is hosting a giant tapeworm, I’m tempted to take them to IHOP and Applebee’s to see just how many plates they can polish off. Since I assume that IHOP pancakes are only pennies per flip, not too worried about that chain. But Applebee’s might want to start stocking up on extra shrimp.